Volcano has recently begun selectively announcing the coming addition of the Lavatube to its line of electronic cigarettes. The device is already in production in China, but with a name like Lavatube, it would seem like a no-brainer for Volcano to carry it. The variable voltage device will make a nice addition to their Volcano, Magma and Inferno electronic cigarette lines. The Lavatube is not listed on the Volcano site yet, but indications are that the Lavatube will be aggressively priced at the low end of the variable voltage spectrum, likely under $100 for a complete kit. Edit: Mark at Volcanoecigs has let us know that the Volcanoecig company did actually work with the manufacturer in the development of this device. The Lavatube is of a relatively utilitarian design, although it has already drawn some attention from bystanders during only one day of use. At 125mm long and about 21mm wide, it is very comfortable to hold and use and can be held like a cigar, albeit a fat one. The body appears to be powder coated in a matte black finish which should prove durable, however there are small pin pricks of bare aluminum that show through on the test unit. The end caps are hard plastic, with the bottom one having slight protrusions which prevent the unit from rolling and add a better base when the unit is standing up. A Lavatube logo is silk screened near the base and Volcanoecigs is printed on a small panel underneath the LCD display. 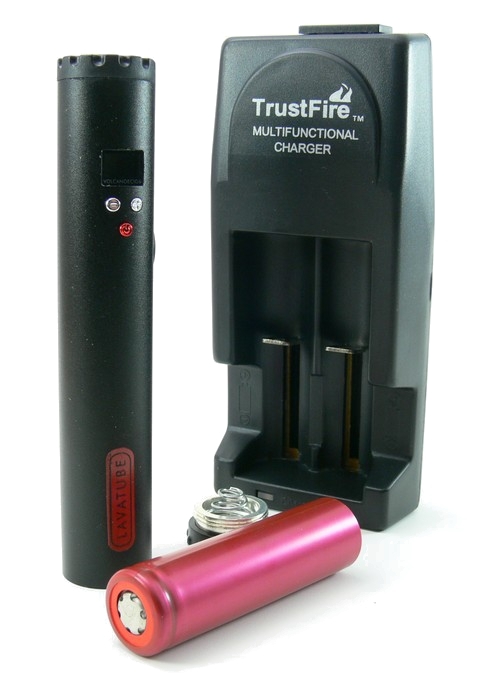 The Lavatube is quite simple, but it incorporates the necessary functions. No manual was provided with the test unit, but usage was simple to figure out. A small red button underneath the LCD turns the unit on and off when depressed for about 3 seconds. Pressing the power button five times in rapid succession displays the battery voltage so that an indication of how much charge is left is easily available. Two silver buttons just above the power button are labeled “-” and “+”, and are used to adjust the output voltage up or down .1v at a time. Voltage adjusts from 3 to 6 volts. A larger black button located a quarter turn away from the power button and display fires the electronic cigarette atomizer. This button is nicely set into the body and has just the right amount of resistance and provides a nice click feedback when depressed. As expected with a variable voltage electronic cigarette, the vape is great no matter what atomizer or cartomizer is being used. The Lavatube incorporates the 510 fitting, meaning that a wide range of options are available. The device has performed flawlessly with both 1.5ohm dual coil and 3.0ohm standard cartomizers as well as 1.7ohm atomizers. Measured voltage is equal to what is displayed on the LCD both unloaded and under load. Atomizers and cartomizers connect easily and there is no apparent movement in the connector. The 18650 battery has easily lasted through a days worth of moderate vaping. Removing and replacing the battery is easy and the threads on the cap feel very secure, if just a little rough. The included Trustfire charger recharges the battery in around four hours. The Lavatube is a good solid variable voltage electronic cigarette tube mod. Fit and finish are average, but performance and design are quite good. The field of electronic cigarettes with variable voltage and displays is a small one, and the Lavatube should be competitive in it. Comparisons to the Provari are unavoidable, and the short answer is that both units will provide nearly identical performance, with the Provari having an advantage on informational capabilities and perhaps fit and finish, while the Lavatube will likely have the advantage on price. 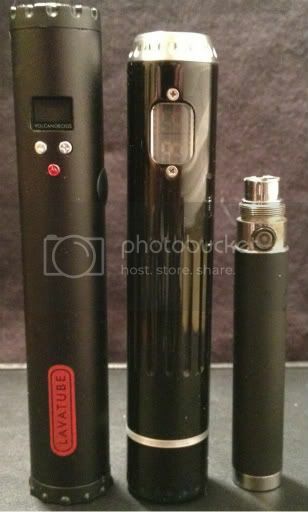 Only time will tell if the Lavatube is reliable, but the first look is a positive one. As the next step up from a big battery electronic cigarette, the Lavatube will likely be an excellent choice backed by a company with great record of customer service. After a couple of weeks of use, the Lavatube has become my daily vape. The device is solid and quite a good performer. Battery life is excellent and I am getting two to three days of moderate use out of a fully charged battery. So far the device has held up very well to being carried in my pocket all day, but it has shown some slight wear of the red paint on the on/off button. There is one note on the voltage that needs to be mentioned. In my initial tests, I used a 3 ohm cartomizer and the device stayed true to voltage at a number of settings. Based on some other reviews, including this video review by Scott Bonner, I became curious about how the device performed with electronic cigarette cartomizers of various resistances. It turns out that the Lavatube incorporates a limiter that apparently cuts out at about 10 watts (if my calculations are correct) to protect the circuitry. Similar devices like the Infinity and Provari will cut off when the wattage is too high while the Lavatube simply limits the voltage. In practice this is perfectly sufficient for me, but if you have your heart set on vaping low resistance at high voltage, the Lavatube is not the answer. All in all, the Lavatube is a very capable and good looking device with a lot going for it. It has definitely earned a spot on my recommendations list. Disclaimer: this early version of the Lavatube was received for the purposes of review from Volcano at no cost. 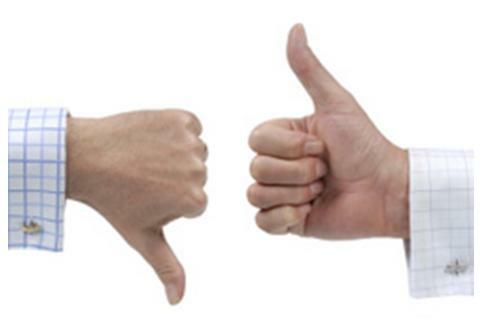 Free demos are greatly appreciated, but we still do all we can to present a fair and balanced review. A very exciting device, Eric! Because of price (and simplicity of use), I compare it to the Buzz Pro and Infinity Pro from NotCigs … and it wins. At least in functionality; I can’t comment on the relative performance. IMO, the digital display and precise .1V adjustment are the greatest advantages of the ProVari over the Infinity Pro or Buzz Pro, but I’ve always found its complexity of use to be off-putting. The Lavatube appears to offer the ideal balance of simplicity and functionality … at a probable price equal to or less than the least expensive of VV tube mods. I can’t wait for its release! I don’t know how, but I didn’t realize the end caps were plastic until you pointed it out. I had to really scrutinize the bottom one, I think the fact there’s metal on the inside and the threads threw me off. Hey this is Magma Mike here from Volcanoecigs.com. Just wanted to clarify that we actually worked with the manufacturer in China to develop this device. It was named the lavatube by us and was made specifically to our specifications. Thanks for the review and the write-up! Happy Vaping! Thanks, Mike! As you can see by my comment above, I am as excited by this device as Eric … and I’ve not even had it yet in my hot little hands. For the information of our readers, the “Inferno” banner on the left of all our webpages represents (and links to) Volcanoecigs.com, one of Vaping Guides‘ very first supporters. I chose that that particular banner, because I regarded the Inferno to be their most interesting product offering. Upon release of the LavaTube, we’ll probably want to change that.